As promised, today I begin bi-weekly posting of stories under the category, "Keeping the Public in Public Domain." The idea behind Public Domain was to preserve our cultural heritage after the authors and their immediate heirs were compensated. I feel strongly current copyright law delays this intent on works of the 20th century. I hope you enjoy discovering new stories. Librarian that I am, I'm starting today with authors whose last names begin with A. A favorite saying of mine is: The alphabet is tool...Use it! Today and my next post in a few days are from Aesop, but two very different stories. 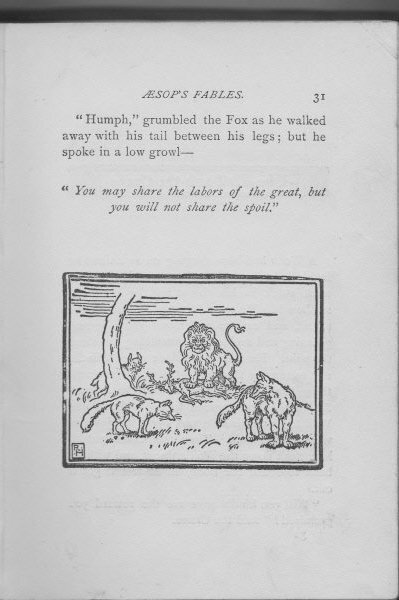 Because Aesop was a true pedagogue, both stories have a lesson to teach. Today's selection was made in a very interesting way. Usually I either read all of a book or look for something to match a specific need. When searching for today's story, the book fell open to this tale. Well! I guess this story knew it needed to be told. 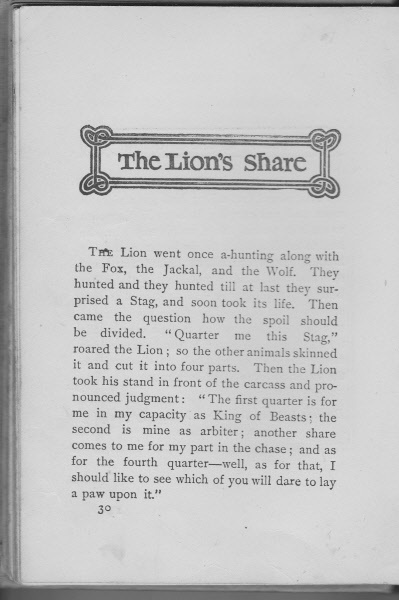 This version of the story explaining the meaning of the term "the lion's share" was collected by that great anthologist, Joseph Jacobs. As a preview of coming attractions, tomorrow is also from Aesop, but from a volume illustrated by John Tenniel, best known for his illustrations of Lewis Carroll's Alice in Wonderland. Then after that the Russian folklore collector, Aleksandr Afanas'ev, has an interesting variant of an Irish spooky tale I frequently tell called "Mary Culhane and the Dead Man."